I’m going to apologize right up front to the scores of local folks who will read this post and complain that I’m poo-pooing the Triad’s dining scene. This post isn’t about the lack of dining quality in the Triad, it’s about the lack of establishments that meet the criteria to be on Food Network’s Diners, Drive-Ins and Dives. Several weeks ago, a producer from Triple D emailed local bloggers to ask for suggestions about places in the Triad that might be right for the show. Ed Cone put up a post to ask for input and many people chimed in. The trouble is, none of these people actually seem to watch the show. If they did they’d know that there are very few, if any restaurants in the area that Guy Fieri should be visiting. That’s not to say the diners, drive-ins and dives in Greensboro, High Point and Winston aren’t good, many of them are. Take one of my favorite sandwich places, Jams Deli, which is just up the road from my office on Friendly Avenue. I love Jams very much and I and the guys at work enjoy eating there at least once a week for lunch. 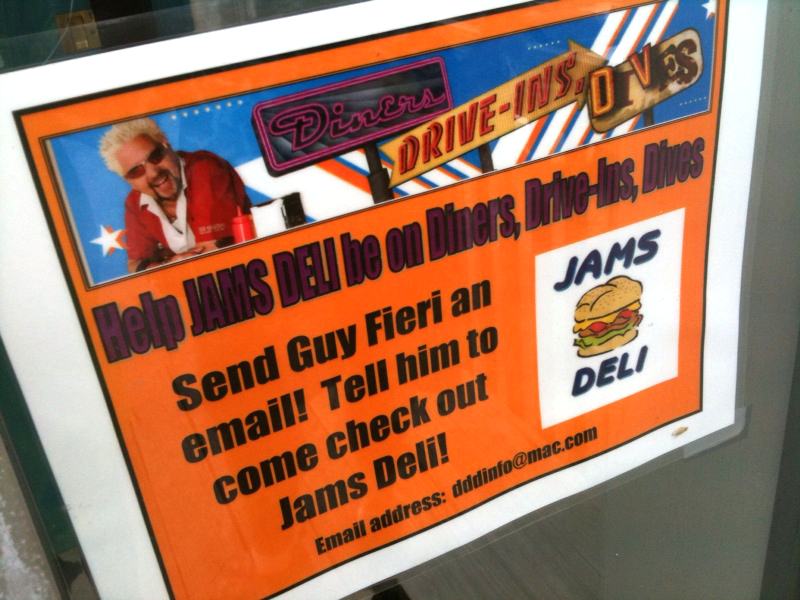 Yesterday I noticed a sign on Jam’s window asking for people to email Guy and suggest Jams to be on the show. As much as I love Jams, they too, seemingly have never watched Diners, Drive-Ins and Dives. If they did they’d know Jams isn’t Triple D material. The eateries that are featured on the Food Network show have at least three things that make them TV worthy. First, they make all their food from scratch. Last time I checked, Jam’s doesn’t make their french fries, hot chips, onion rings, buns or rolls from scratch. Second, they usually have waiting lines out the door at all times of day. The closest place Triple D has featured, The Penguin Drive-In in Charlotte, NC typically has a 20-45 minute wait to get a table any day of the week. Third, they serve interesting food. Over at Cone’s, Liv Jones suggested Johnson’s in Siler City for their yummie burgers. While I respect Liv’s opinion, Siler City isn’t the Triad, and Johnson’s burgers have nothing on burgers featured on Triple D. The places the producers are looking for have notable items no one else has. Like homemade fried pickle chips or a giant hot dog affectionately called “The Homewrecker”. Same goes for almost all of the other places I saw suggested at Cone’s blog: Country BBQ (it’s good, but it’s also standard NC fair) Beef Burger (ate there 2 weeks ago, absolutely over rated, not all food made from scratch), Texas Tavern (in Virginia, not the Triad, no interesting food items). About the closest I think would meet the show’s criteria is Yum Yum. Because it’s a college hangout, it’s always busy and people rave about the place, but I don’t know if the food is made from scratch or what. At this point I can sense you really are upset with me. Upset because I’m not begging the producers of Diners, Drive-Ins and Dives to come to Greensboro and film their show. Trust me, I’ve watched every episode and no one would love for them to come here more than me. I would just love to be able to point them at a place like Henrietta NY’s Dibella’s Old Fashion Subs and say “This is the place you’ve been looking for!” But I can’t. If there was a place in the Triad that deserved to be on the show, I’d be eating there every single day. Of course there are plenty of places in Greensboro I’ve never been, so go watch a few Triple D clips and get a sense for the kind of food they showcase. If you still think you know a place that can measure up, suggest it in the comments. I would love nothing more than to be proven wrong, wrong, wrong on this one. In the meantime, I’m heading to Charlotte to check out Penguin. Who’s with me? You know what, I argue that Siler is the Triad… Commerce-wise. I’m not sure why there’s a need for people inside of Greensboro to isolate their suburbs based on some imaginary line. I live in a town which use to be apart of Guilford County. Guilford County use to be apart of Orange County… it’s all relative. I don’t think 30 miles is too far to consider it apart of the triad’s social and economical base. Besides… give it time… Greensboro will annex it eventually. The thing about DD&D is that they look for a place that either makes their featured items from scratch and/or takes diner-type dishes and pushes them “over the top” or fuses them with some other type of cuisine in an unexpected way. With so many of the places on that show, I’d be willing to drive a good distance just to check them out. Even with all of that, I’m not sure it’s enough to make the cut. Not that the food wasn’t absolutely delicious, but it may not offer that unxpected “je ne sais quoi” that DD&D looks for. Who knows? Maybe it does. Anyone else have a hidden gem? Well, I have to admit it has been quite a while since I’ve eaten there, so things may have changed. I just read your review of Johnson’s in Siler City. And… well… I will add that Fincastles is no Tommy’s. I still think it was good, but not in *that* league. In fact, I’ve not had anything that does come close, so I had long since stopped trying to compare other burger joints to them. Note to self: do not lower standards, ever, even if it’s been 17 years since you’ve lived in L.A.
And, I have never waited in line for The Penguin…good food though, and the best jukebox in NC. if yum yum’s is the place please tell me how many different ways you can make a hot dog there, ketchup,mustard,slaw and chili. In DDD you will need to have a aray of menu items. The line is out the door sometimes because plenty of people don’t know that you can order all the way down the line not just a cash register. I have always wondered for well over 25 years why Yum Yum’s doesn’t offer french fries. It must be something with having a exhaust system for the fryer. Of anyone knows please let me know. Ged , i agree with you on your assessment. There might be a BBQ place in lexington that could meet the criteria but haven’t seen anything around here for that.